Finding the assets you need on your website can be a real challenge. If you've ever tried to organize a lot of files on your computer you've likely run into the limits of using a single hierarchy. More often than not a single file might belong in more than one place. A single image might belong in /client_assests, /headshots, and /lifestyle. You either end up with three copies, a lot of aliases/symlinks, or just make a choice and live with a less than accurate model of your data. In reality, most assets belong in many different categories, not only one. File sets let you easily organize files in this new organic fashion. You can add a single file to as many sets as you like. Sets can have an order, but that order is tied to the set, not the file. So that image that fell into many folders above could easily be in a set for each, and might be first in line for one set and burried deep within another. Sets can not contain other sets. 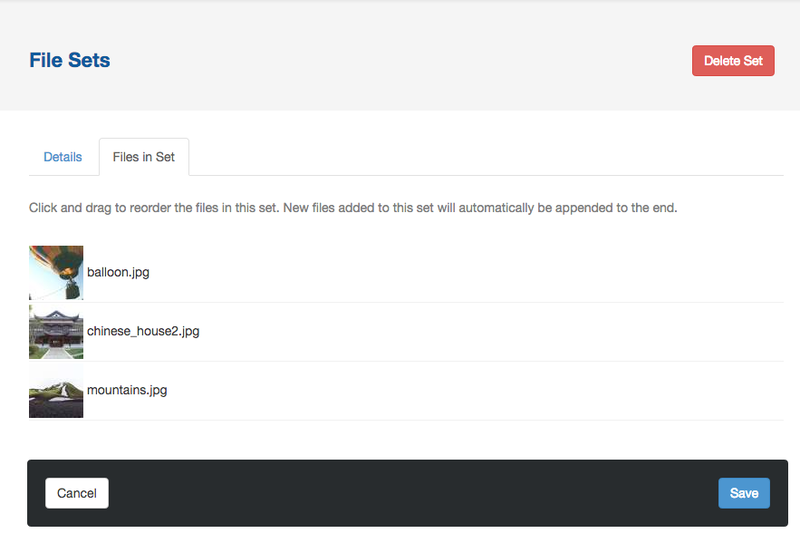 Once you get to the Set detail dialog, you can add the file to existing sets, or create a new one. The field at the top limits the sets shown. If you've got lots and lots of sets this is very handy. Checking the checkboxes next to existing sets lets you add the file to multiple existing sets. You can add a new set by just typing a name for it. 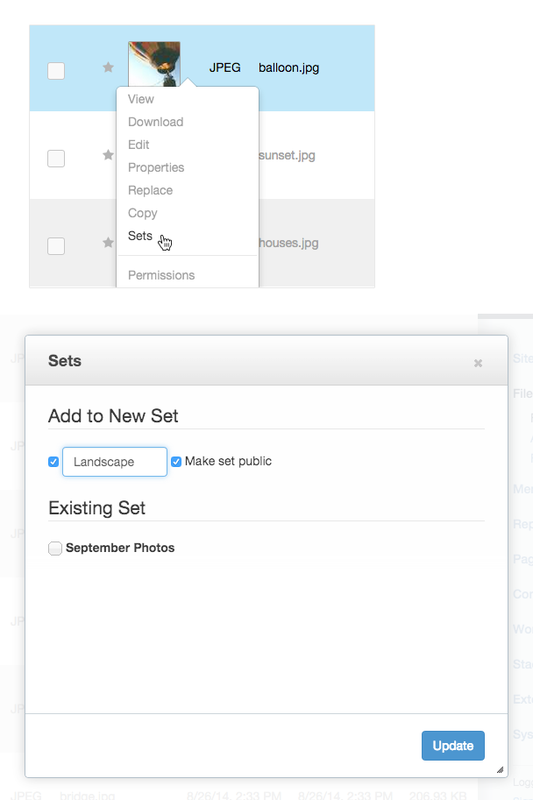 Sets can be shared with anyone or tied to permissions (Hence the "make set public" check box). Once you have some sets made, you will see a "In Set(s)" option in your file manager. You can add multiple sets to this search and the results will only display files that are in BOTH sets. You can remove a set from the search filters by simply clicking the X next to its name. You can change the name of a file set, and change the order of the files within that set. On the file sets page, you are presented with a list of all of the sets on your site. You can also create a new set from here. The Details tab lets you change the set name. The Files In Set tab shows you all the files contained in the set, and lets you drag and drop the order of those files for the set. 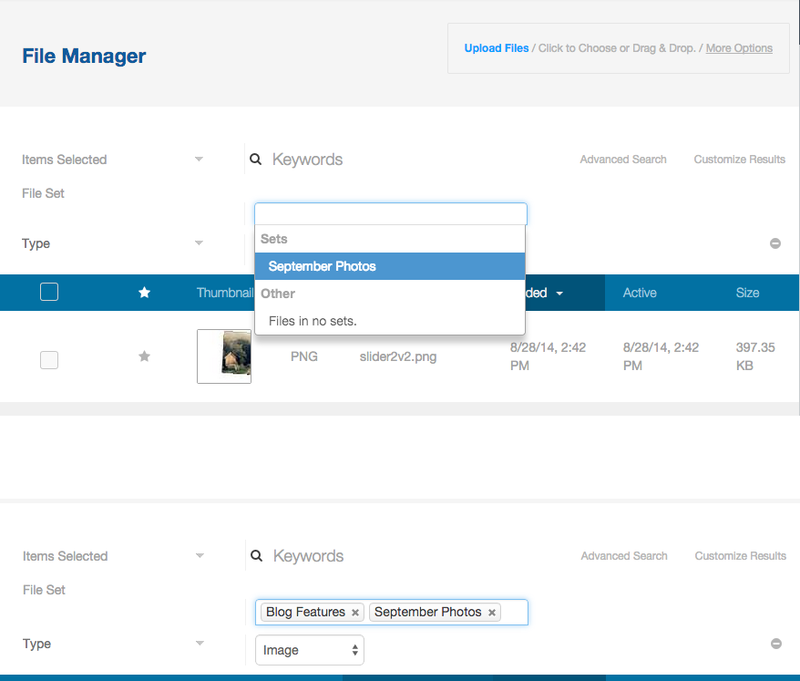 This is very handy for the many image galleries that honor set order in our marketplace.